It is possible for a persistent cough to have psychological causes. Stress or anxiety can affect our breathing patterns, irritating our throat and restricting our oxygen supply. Coughing feels like a natural way of relieving this issue but in reality it has very little effect. 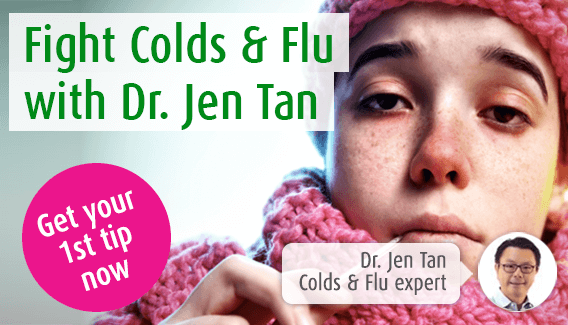 Our immune system expert, Jen Tan is on hand to determine the symptoms of a nervous cough and to offer advice on how to alleviate the problem using herbal remedies. A persistent dry cough can be a worrying symptom, but in some cases, there is no physical reason behind the cough. Instead, the cough may have psychological roots. This is most common when feeling stressed or nervous, and this type of cough is unlikely to occur once the sufferer is asleep. What is a nervous cough? A cough can often be a symptom of anxiety. It occurs in the absence of any physical problems with the respiratory system, such as following a cold or flu, but can be seen alongside other stress or anxiety symptoms. One of the most common symptoms of stress or anxiety is hyperventilation when breathing becomes too rapid and shallow. Irregularities in breathing, and insufficient oxygen supply irritates your throat and can make it feel as if your throat is restricted. For some reason, it can seem that coughing will relieve these symptoms. However, in many cases it has no effect, and instead prolonged or persistent coughing develops. Latterly, you may not even be aware that you are coughing. Although there is not a clinical test which diagnoses a nervous cough, often this type of cough has a characteristic profile which is easily identified. First of all, it is important to rule out any physical cause of your cough, such as a bacterial or viral infection, asthma, or any other problem with your airways. If there is no physical cause, then your doctor will then consider anxiety symptoms. If your symptoms are at their worst during stressful experiences, such as during exams, then this is indicative of a nervous cough. Some people also find they begin to cough when they are struggling to find the right words, for example in an interview, as it acts as a time-filler while your brain frantically tries to think of a good response. More than half of people who have a nervous cough may also have a psychiatric condition, such as depression or phobias. Cough becoming worse during a stressful time, and better during fun or enjoyable activities. Treating the root of the problem is usually the most effective course of action, as this tackles all of the symptoms experienced. For this reason, a nervous cough is often improved with some type of anti-anxiety treatment. Initially, it is worth ensuring that you are not hyperventilating by taking deep slow breaths, breathing in to a slow count of 3 and out to a slow count of 5 to 8. As there is no physical reason behind the cough, there is no harm in suppressing it. Every time you feel the urge to cough, stop yourself from doing this, and gradually you will teach yourself to stop coughing. If it helps, take a sip of water every time you need to cough. Some people find that Cognitive Behavioural Therapy is beneficial in treating a nervous cough, as it changes the way we respond or react to a situation. It teaches how to respond positively towards stressful situations, reducing the symptoms of anxiety experienced. To support these home treatments, herbal remedies may be effective. For example, the herb Valerian has a tranquillising action, helping to calm the nerves and reduce symptoms of anxiety. It can be found in licensed herbal remedy Stress Relief Daytime. Additionally, Avena sativa, or oats, has been used as a nerve tonic for hundreds of years. It is recognised as being important for the proper functioning of the nervous system. Fresh extracts of Avena sativa can be found in licensed herbal remedy AvenaCalm Avena sativa drops. A doctor may be reluctant to prescribe any medication for a nervous cough as there is no physical cough behind the cough. However, he is likely to support home remedies for the treatment of this type of cough, and may also suggest anti-anxiety or tranquillising medications. However, you should be aware of the side-effects of these treatments.